In vitro fertilization (IVF) is the process of retrieving eggs and sperm and manually fertilizing them in a laboratory dish outside the womb. Healthy embryos are then transferred back into the uterus with the goal of implantation and further embryo development. IVF is performed by physicians who specialize in reproductive medicine and have received additional education and training in the evaluation and treatment of male-factor and female-factor infertility. IVF was originally developed in the early 1970’s to treat infertility caused by blocked or damaged fallopian tubes. Louise Brown, born in the United Kingdom in 1978, was the first baby conceived with the help of IVF. She made headlines again in 2006 when she went on to naturally conceive a healthy baby of her own. The technology of IVF and advanced reproductive technologies has improved markedly since then; and over 3 million babies have been born since Louise Brown with the help of IVF. In order to maximize the patient’s chances for successful fertilization, a patient undergoing IVF usually take hormones in the form of injections to increase the number of eggs produced in a given month. Frequent monitoring is performed to continuously follow a woman’s ovarian response, allowing the physician to adjust and time medication dosage appropriately. Under sedation, the reproductive specialist extracts mature eggs via ultrasound guidance. Egg retrieval is a minimally invasive procedure that normally takes less than 15 minutes. Patients typically can resume normal activity within the next day. 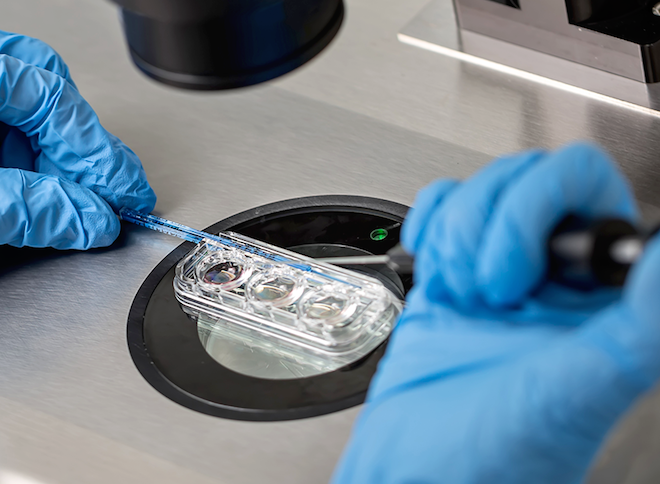 Embryologists use high-power microscopes and steady precision to fertilize the eggs with sperm in the embryology laboratory. At times, the sperm are released on top of the oocyte to fertilize it. In other cases, especially when there are less than one million living sperm, intracytoplasmic sperm injection (ICSI) is used where a single sperm is microinjected directly into the cytoplasm of the ovum. A fertility specialist will transfer the minimum number of healthy and mature embryo(s) back into the uterus, with the goal of implantation in the uterine wall. This procedure usually does not involve any sedation. The physician will use ultrasound to guide a small catheter through the cervix and deposit the embryo(s) in the uterus. The embryo transfer procedure takes only a few minutes and recovery time is less than a day. Remaining viable embryos can be cryopreserved and used for subsequent transfer cycles. A pregnancy test is performed 11 days after the embryo transfer to evaluate whether implantation successfully occurred. To learn about IVF at RMA of New York, please contact us, or make an appointment.